You might think you’re too busy or don’t have enough skill in decorating your home, but I think you just need some guidance and a plan to follow. That’s what my design consultation provides and it can make all the difference in the world. This is not a casual conversation about decorating. It’s a #getitdone meeting to develop the plan that will transform your room. After our meeting, I’ll spend another hour in my office, gathering goodies to send to you. These might include a short video summarizing your plan, paper samples of any paint colors we selected, source recommendations and a digital floor-plan. This consultation is a fast-track version of working with a professional, experienced designer. It can save you an enormous amount of time and money. My degree in interior design and depth of experience allow me to provide top notch, in-depth guidance. If you enjoy shopping and executing a plan, this is the perfect service for you! With this service, you get the design plan AND a direct path to the recommended products. This is still a fast-track way of getting professional design advice for your project. You’re still saving a great deal of time and money because much of the shopping is done, but you’re handling the ordering and managing the project from here! 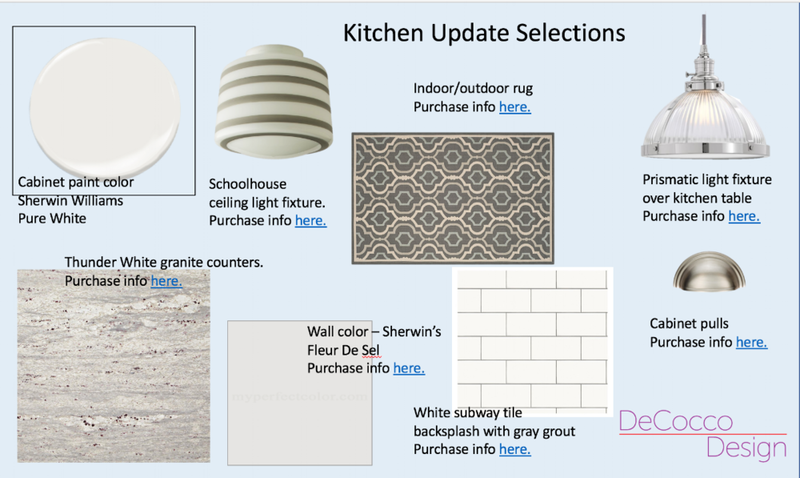 This is an example of a digital design board showing products and links that highlight sources to find each one. This is provided to clients who opt for both Design Service #1 and #2 and usually includes a couple of boards. Click on over to my Contact page to receive more information, including a link to schedule a free, no-obligation Discovery Call. We’ll talk about what you need as well as the benefits and parameters of the two services I offer. I look forward to helping you create a home that makes you smile. Save time, save money, get it (beautifully) done. Your home is finally going to look the way you want it to look. This will make it easier to live in and easier to entertain in. Check this off your list!